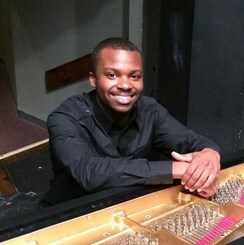 Ronald Rex-Williams is a multi-instrumentalist. He began singing in elementary school, where he learned the fundamentals of music. Though he first became proficient on the drums, his true love was the piano, and it's where he focused his efforts. He has also taken his knowledge of music and learned the guitar and bass as well. Although first self-taught, he later studied at Anne Arundel Community College, and received an Associates Degree in Arts: Music. He now teaches group piano classes with the college and has for two years. He has studied classical, jazz, and even African music. He's done many gigs in the Annapolis area, and has played with several of the music ensembles at Anne Arundel Community College, from orchestra to jazz band for three years. He's played piano for churches for over three years as well as drums for over five years. He also has three years of experience doing live stage set-up and audio mixing. His teaching style is centered around developing a well-rounded musician, who can take their knowledge into whatever genre the student chooses. With a lot of experience working with kids as well as adults, he is able to teach all ages in the area of music theory, reading and writing music, ear training, and improvisation. Lessons are centered around the students interests, so whether you want to learn to read and understand classical pieces, or how to figure out your favorite pop tune by ear, a personalized curriculum will be created for you. Request Lessons with Ronald today!